The Royal Society publication, The Scientific Century: securing our future prosperity. Click image for original. Why go to graduate school? To win a Nobel Prize one day? You like the work (me)? Someone has offered you a position (Paid to learn – great!)? There are many reasons to start – and complete – a PhD. Current academic training creates many candidates for limited career positions. Much has been written about this and we’ll be discussing different aspects at #scio13. BioInfoTools wrote a background piece for this session with some great links. But training many talented people for a few coveted spots is not unique to science; it’s common in classical musicians, athletes, and more. Is a classically trained pop star a failure? Is a hockey player who pays the bills playing in the minors a failure? It depends if you base your definition of success on the training criteria or on other measures. I don’t think scientists who aren’t tenured academics are failing, but it is often a hurdle for trainees to accept new measures of success. I always loved science, but I was good at music. It was easy for me to win local competitions and it seemed natural to study music. Once I started my performance program, I realized that I didn’t have the passion to spend all my energy on music – and without that, I would never win the coveted orchestra position. I stopped studying music and remained on good terms with my teachers – until I decided to pick up some studio work. Several teachers then informed me that I was wasting both my gift and my training and that I should return to ‘real music’. But I was happy with this job and ignored their disapproval (the money and better working conditions helped). It was strange that it was frowned upon more for me to pursue music on a different path than it was to just quit entirely. So why have I told you this? It parallels some stories relayed to me by friends leaving academia for industry. From the outside, it doesn’t seem like a big deal. You still have a job and you are using your skills. Yet there is that little voice telling you that you’re giving up or wasting your talents. An orchestra job is amazing, but it wasn’t meant for me at that time (and definitely not now!). But this also means that I quit a closed system before – and survived. So when I realized that I didn’t want to be a tenured academic, it was easier for me to choose another path. Sure, I still had some pangs of guilt, but knew that I had to do what was right for me. In both music and science, I also realized that I didn’t have the natural talent to make it without all encompassing commitments. I wasn’t willing to sacrifice everything for these two very selective career paths, each with no guarantee of success. People are often older when making decisions to leave the science academic path (but not always; read this great long read about an audition for the Boston Symphony). 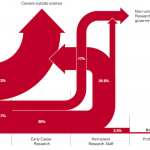 There are conflicting messages about needing more scientists, but only 2-5% of scientists get academic positions. Each provide different things to the world, but I am trying to focus on the experience of the trainee. The limited spots seems to be a newer thing for science so we are adjusting to the new proportion of jobs. There are many different ways to use your science training. You have to do what works for you. But how do we get this message through to students while training? Should we enhance the academic training to include more transferrable skills? How do we alter the message? Updated Jan. 30: added the note about identity crisis and the timing differences. I, too, jumped out of the traditional academic trajectory when I opted for full-time teaching at a college instead of a postdoc after I got my Ph.D. I’ve made my way back into the Ivory Tower of Academia because I’m a pretty good teacher (but no expert, despite my 10,000 hrs, most of it marking 😉 Like you, I have twinges of regret, mostly for not having a long list of publications. But when I see pre-tenured colleagues, stretched to the breaking point, I’m happy with the #altac path I’ve followed. I definitely think we should include more transferable skills-training in the graduate and postdoctoral training programs. I know so many PhDs and postdocs that are “stuck” for long periods of time, not able to secure a tenure-track position and not having the skills to move to the industry, non-profits, government, science communication etc. Not to mention the fact that many of the scientists who actually make it to professor would be better scientists had they had a bit of training in communication (higher chances of getting grants), conflict solving (which is highly needed in academic labs), and project management. The more transferable skills the better, I think. Project management, facilitation, coordination, teaching, curriculum development, the list goes on. The more skills you gain as a graduate student the better prepared you will be to move from the tenure track path (which, for most of us that move might need to happen given the stiff competition these days). I feel like I’m still on a winding path, trying to figure out where it’s all going – but I wouldn’t be here if it weren’t for the PhD so although there are many days when I wonder “why did I go to grad school?” I’m still glad to be discovering this path I’m on, and grateful for all I’ve learned along the way.